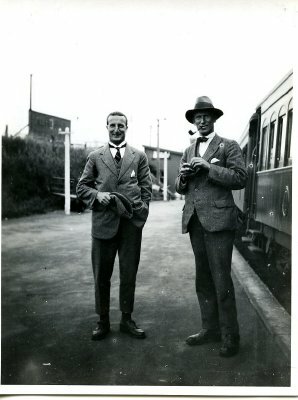 Description Train Engine waiting at Patea, with Mr. Edmonds and Mr. Little standing on the platform. Inscribed on back of photograph: "Edmonds & Little (a member of the firm Weston & Billing, solicitors, ?) on the Patea station."